I discovered this dress on Etsy months ago. Vintage, in my size, and in the most perfect star-print fabric that I’ve seen. It didn’t take me long to talk myself into buying it. I had to have it altered when it arrived, but since then it’s become a favourite part of my wardrobe. 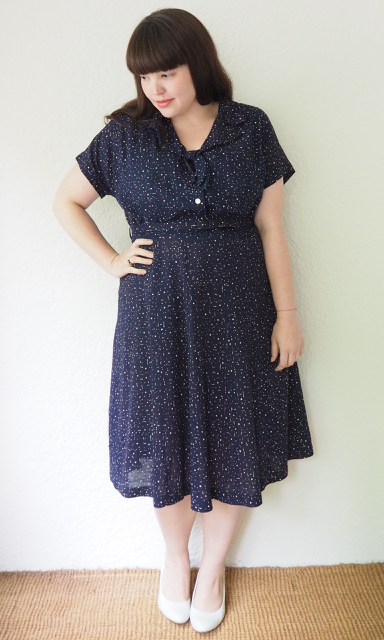 Vintage dresses are nigh impossible to find in larger sizes. Possibly it’s because in thriftier times they’d be cut down for younger siblings or children, or because we’re simply larger these days, or possibly it’s because of all the unscrupulous scavengers who buy them up, lop the hems off, whack in an elasticised waist and add a zero to the price-tag before selling them on to knobble-kneed teenagers at hipster craft-markets. None of the vintage clothing stores in Australia seem to have much on offer for larger sizes, apart from the specialist stores Bombshell Vintage, Hey Fatty, and the occasional lucky find at the A+ Markets. 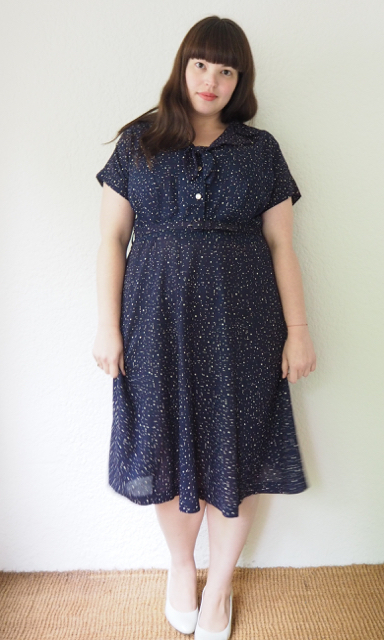 Online I’ve found the best place to look for plus-size vintage is actually Etsy. Size is Just a Number is a good place to start, or Re/Dress Vintage. If you see something you like you should snap it up straight away, because I can almost guarantee you won’t find it again anywhere. I’ve missed out on a few pieces because I hesitated, which is why I jumped on this dress almost immediately. 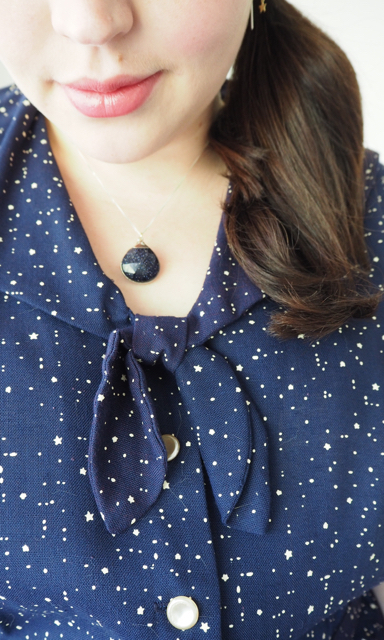 It has a cunning speckled star print, mother of pearl buttons and a sailor-style collar. 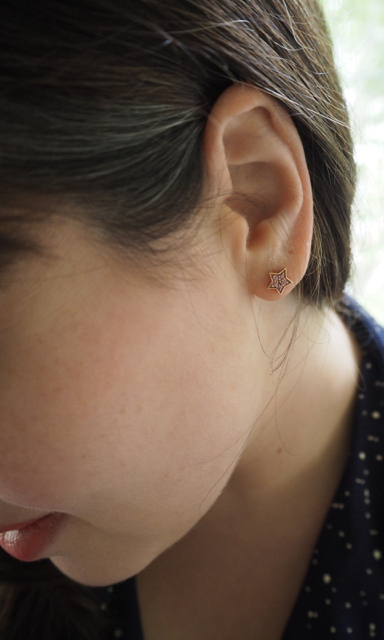 I’ve been wearing it with the beautiful Andromeda Earrings that Sian Giplis, founder of The Jewel Collective sent to me in November, and which I’ve been wearing pretty much non-stop since then. These lovely earrings are made from rose gold and pink sapphires and are named for the Greek maiden who was transformed into a constellation of stars by Athena. I certainly did! The box sits on my dressing table, and I’ve taken the pouch with me on my last few interstate trips as it’s the perfect size to tuck a few pieces safely away in my suitcase for wearing later. 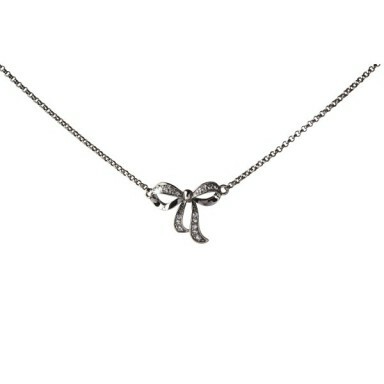 I’ve got my eye on the gorgeous Charis necklace now, and I think I’ll have to treat myself once my bank account has recovered from Christmas! This entry was posted in Uncategorized and tagged dress, etsy, vintage, warm by lillipilli. Bookmark the permalink. So jealous, Lilli you look absolutely stunning in that dress. Coming from someone that has also had a challenging life changing year I really hope 2015 brings you happiness and more than a bit of fun!! You too, Gen! Onwards and Upwards for both of us! 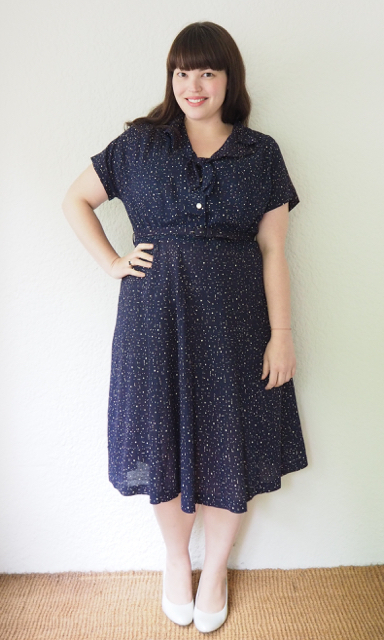 If a little self-promotion is ok, I sell women’s vintage clothing on Etsy and as a plus size lady myself, I know how hard it is to find cute vintage in larger sizes, so expanding my plus size inventory is important to me. You can find my plus size section here: https://www.etsy.com/shop/StrangerBirdVintage?section_id=14066393 , and also check the sale section. I ship worldwide! Another Etsy seller I’d recommend is The Curvy Elle, her prices are very reasonable. Thanks for highlighting Etsy as a source for vintage goodies! Of course! Thanks for the heads-up, Jenny! Oh those earrings are DIVINE!!!! I love them! 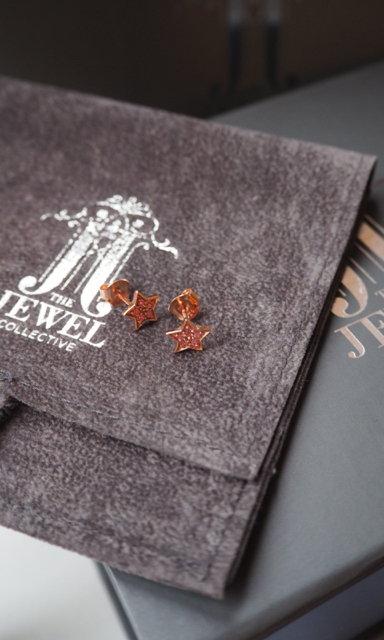 I fear I may have found a new obsession in the jewel collective! Her pieces are gorgeous and so well done. Sian’s jewelery is gorgeous – I wouldn’t hesitate to give them two thumbs way up! Oh, too funny, I almost bought that EXACT dress on Etsy. When it sold before I made up my mind, I thought I’d never see it again. It looks great on you! I’m glad you snapped it up. I seem to do just fine finding vintage in person in the States, which is why I limit my online purshases. 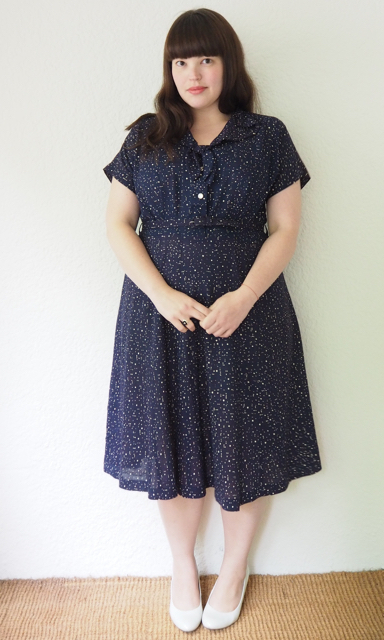 Portland at least has enough good plus-sized vintage that I have literally run out of room in my closet.